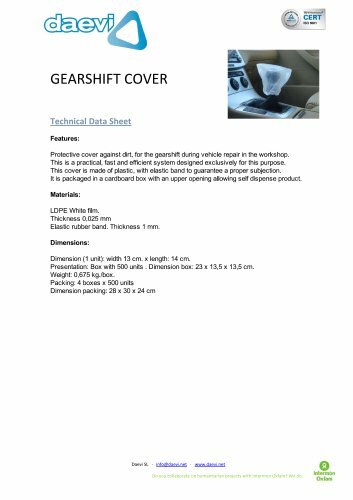 Features: Protective cover against dirt, for the gearshift during vehicle repair in the workshop. This is a practical, fast and efficient system designed exclusively for this purpose. This cover is made of plastic, with elastic band to guarantee a proper subjection. It is packaged in a cardboard box with an upper opening allowing self dispense product. Materials: LDPE White film. Thickness 0,025 mm Elastic rubber band. Thickness 1 mm. Dimensions: Dimension (1 unit): width 13 cm. x length: 14 cm. Presentation: Box with 500 units . Dimension box: 23 x 13,5 x 13,5 cm. Weight: 0,675 kg./box. Packing: 4 boxes x 500 units Dimension packing: 28 x 30 x 24 cm Daevi SL • info@daevi.net ■ www.daevi.net Do you collaborate on humanitarian projects with Intermon Oxfam? We do.